Juggling the demands and learning curve of blossoming adolescents is tough, but just what if this process prepared parents for handling their own aging parents? 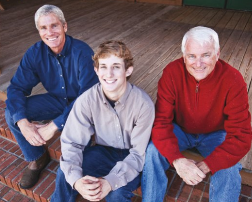 Understanding where similarities lie between teens and aging parents puts a new twist on the popular theme of feeling “sandwiched” between these two lovable but stretching generations. Though her book focuses on teenage girls, her mantra of not getting pulled into the drama is at the heart of her family counseling strategy, a message she was privileged to share onstage in her TEDx Talk last year. Not getting sucked into the drama, she says, is equally critical for adult children in their relationship with aging parents. Watching teens’ nonverbal signals grows increasingly important because often, many things go unsaid, simmering below the surface. Noting expressions, the way they walk through the front door or hastily leave the dinner table offer clues to what’s going on. Similarly, there’s a lot to be learned from watching aging parents. How’s their driving? Do they struggle with balance or basic housekeeping? Evesham advises that if your aging parent loves reading, for example, but is struggling with seeing the text, consider buying large-print editions. The take-away: Do what is possible to maintain their dignity and independence so they can continue doing what they love. Knowing when to intervene requires discernment. Sometimes parents have to be reminded that their teens deserve respect; aging parents deserve no less. O’Grady sheds light on where the “drama” comes from, explaining that aging parents can spend a majority of their days in the limbic system of their brain, i.e., the reactive part. Prompted by fears of losing control, their independence or their dignity, fear of the future, among other things, makes aging parents prone to “a plethora of negative emotions — especially anxiety.” The brain, she continues, goes “off-line” from the higher brain — the cerebral cortex, which is the big-picture, problem-solving part of the brain — and instead lodges in the limbic system, the reactionary part. Likewise, teens often tend to live in the brain’s reactive limbic system, but unlike their grandparents, they do so because their pre-frontal cortex, responsible for cognitive behavior, is still in the process of development. The poor judgment and reasoning piece is where LuAnne Smith, geriatric care manager and elder care consultant, sees similarities between teens and seniors. “However, the sad difference is that we expect our teenagers to ‘get better’ while our elderly parents continue to decline and eventually pass on,” she said. Even when there’s no dementia, O’Grady says cognitive decline is common in the elderly, so they will typically get emotionally flooded and react quickly, seeing events in the extreme. It’s a struggle to demonstrate our sincere care for aging parents without making them feel like they’re being shadowed. This sage advice is reminiscent of counsel given to parents regarding their teens, to give them space to live their own lives. Barring medical problems, this learned posture conveniently provides adult children a useful template for caring for aging parents. Just how do those in this middle zone with one arm around teens, and the other around aging parents, broker the tension? We all absolutely need the help and support of others, O’Grady says. Step back, make a plan and build a team of supportive adults to help you. “You can’t do it all by yourself,” she says. Indeed, parenting teens and caring for aging parents are roads best traveled with a supportive community.